Supermarket giant Tesco has reported an underlying £2.25bn profit for the past year, 17% higher than the year before. The firm, which has a 30% share of UK supermarket sales, said the results represented "good progress in a more challenging year". Tesco saw strong sales both in the UK and abroad, with UK sales rising 10.7% and foreign sales increasing by 23%. The retailer also said it would dedicate £100m to a new fund to invest in environmental technology. 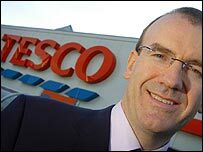 Tesco boss Sir Terry Leahy said he was satisfied with the firm's performance over the past year. Total sales rose 13% to £41.8bn, while like-for-like sales - which exclude new store openings - at its UK outlets rose 7.5%. Group profit before tax - another measure of profitability - came in 16.7% higher at £2.21bn. 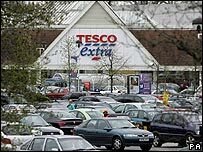 Tesco also said that it planned to release £5bn in cash from property transactions over the next five years, £1.5bn of which will be used to buy back shares. However, it denied claims that it had bought up land in the UK not for its own needs but in order to prevent competitors from getting access to it. "There is no such thing as a land bank," Sir Terry said. "We only own land in order to develop it for Tesco. If we cannot develop it for Tesco, we sell the land on." In the UK, the retailer plans to open another 130 Express convenience stores during the current year. It will also open three more stores selling non-food items only after a successful trial last year. The past year saw substantial international expansion, with non-UK sales now accounting for nearly a quarter of Tesco's total revenues. The retailer opened 238 new stores overseas last year and plans a further 419 international store openings in the current year. Overseas growth is being driven by Asia, where Tesco is market leader in Thailand and is expanding in China and South Korea. Profits from its Asian operations rose 30% last year but tough trading conditions saw a fall in profits in Japan while losses widened in Taiwan, which Tesco is seeking to exit. The UK's Office of Fair Trading is currently deciding whether to trigger a full competition inquiry into British supermarkets, amid concerns that they are squeezing out smaller, independent stores. Sir Terry denied suggestions that Tesco was now totally dominant in the UK supermarket market. "You are never dominant in this industry," he said. "Ours is a very competitive market and we have to fight every day for our customers. "People are not worried about Tesco being dominant. They are worried about supermarkets doing a good job for them." But Friends of the Earth said Tesco now had a 45% share of supermarket sales in some towns and that its growth must be curbed. "Tesco's booming profits come at a cost with consumers, farmers and our environment paying the price," said campaigner Sandra Bell. Tesco had to "fundamentally change" its business practices if it wanted to reduce its "negative impact" on the environment, she added.